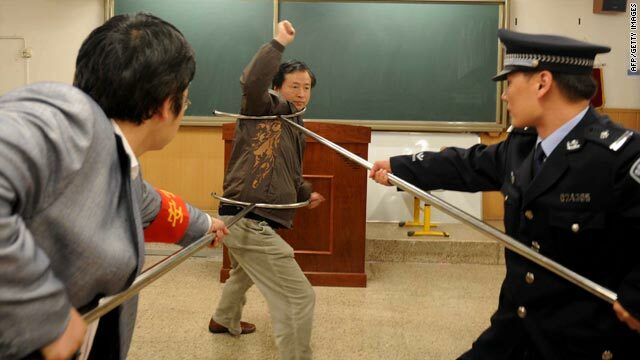 Police officers show teachers and school workers at a Beijing school how to defend themselves during an attack. Beijing, China (CNN) -- Early in the morning on March 23, Zheng Minsheng walked in front of an elementary school in Fujian province. Wielding a knife, he attacked the students who happened to be around, killing eight and wounding several others. Authorities said Zheng, 42, carried out the attack because he was frustrated at "failures in his romantic life," according to the official Xinhua News Agency. Whatever his real motive was, the senseless killing, reported widely by the Chinese media, shocked the nation. Zheng was tried, sentenced to death and executed on April 28. If Chinese authorities thought Zheng's execution would deter similar attacks, they were wrong. The day he was executed, a knife-wielding man attacked elementary school students in southern Guangdong province, wounding 16 students and a teacher. The attacker was later subdued by the police, and no one died. The next day, a man in Jiangsu province barged into a kindergarten and stabbed 31 people, including 28 students, two teachers and one security guard. "It was too horrible to imagine," one eyewitness told local reporters. "I saw blood everywhere." Police apprehended the suspect, 47-year-old Xu Yuyuan. Video: What's driving attacks on China's kids? Then, on April 30, a man barged into a village school in Shandong province, carrying a hammer and a can of gasoline. Wang Yonglai, a local farmer, attacked preschool students with the hammer, causing head injuries. He then set himself on fire and died. According to a Xinhua report, the local farmer went berserk after the local police told him that the family house he had just built using 110,000 yuan (US$16,110) of family savings had to be torn down because it had been built on farmland, which is illegal in China. It was the third such school attack in three days. The spate of school attacks is prompting public anger. "What is going on with these people?" Wen Jia, a father of a pre-schooler in Beijing, asked CNN. "Why take their frustrations on defenseless children? We need better security in schools, but we also need to take care of the mentally ill."
On Friday, the Ministry of Education on its website issued an urgent circular ordering kindergartens, elementary and secondary schools to beef up security and restrict strangers from entering the campuses. The ministry instructed schools across the country to hire security guards, install security facilities and ensure that pupils are escorted home. Schools are also urged to teach pupils to how to protect themselves. Guns are strictly controlled in China, but until recently possession of large knives were not. Chinese authorities have recently issued a regulation requiring people to register with their national ID cards when they buy knives longer that 15 centimeters. Why take their frustrations on defenseless children? Other measures are being put in place. In Jiangsu province, local police have helped schools set up "campus security team" composed of 70 security guards with batons and pepper spray. Police in Beijing have distributed "forks", long poles with semi-circular prongs that security guards could use to fight assailants. In Changsha, capital of central Hunan province, parents formed vigilante teams to patrol local elementary schools. This series of school attacks are blamed on people with personal grievances or suffering from mental illness. Says Ding Xueliang, a sociology professor in Hong Kong: "The Chinese society has generated enormous pressure on individuals and some of those individuals have perhaps had emotional and psychological problems. They want to cause general attention from the population and attacking kids perhaps is the best way from their perspective of achieving this objective." These recent incidents are covered extensively in the local media and on the Internet, prompting concerns over copycat violence. Says sociologist Ding Xueliang: "With the mass media (reports), particularly on the Internet, more individuals are likely to copy such practice, if the Chinese government does not do things quickly and effectively." For the terrified pupils and worried parents, the solutions are not coming quickly enough.